Figure2: Results of simple Top query. 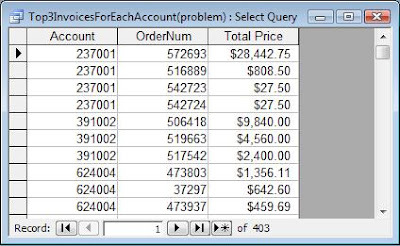 As useful the simple top query is, what if I wanted to find the top 5 Accounts by total sales rather than individual invoices? 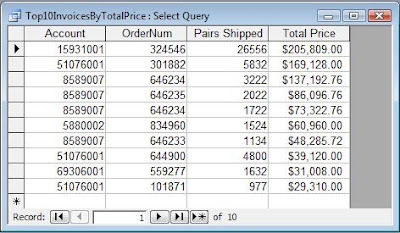 The solution is to use a Totals (or Aggregate) query. Notice the addition of the Group By clause and the Sum function. The result of this query can be seen in Figure 3. Figure 3: Result of top 5 accounts by total sales. Another useful thing to do with a Top query is to return the top values for each of a group of data. For instance, suppose instead of the top 3 values for a particular Account, I wanted the top 3 values for all Accounts. To do this, I need a correlated subquery. A subquery is a SELECT statement nested inside a SELECT, SELECT...INTO, INSERT...INTO, DELETE, or UPDATE statement or inside another subquery. A correlated subquery opens a separate instance of the table for each record in the main query, allowing you to compare the results of the subquery to results from the main query. This creates an "alias" for the table, renaming it I2. This is important because when we embed this query within another query also based on the Invoice table, it needs to know which instance of Invoices we are asking for. If we run the subquery as is, it will ask us for the value of Invoices. [Account] in a parameter prompt. If we give it an account number, say 391002, it will return the top 3 values for that account. And returns the values in Figure 4. 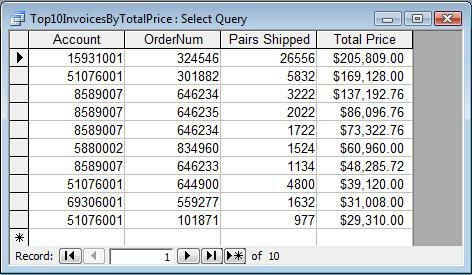 Figure 4: Shows the result of the query to show the top 3 invoices for each Account. Notice, however that account 237001 has 4 values. Why is that? Because two records have the same value, Access cannot decide which to display, so it displays both. Duplicates can happen in both simple and group top queries, but the solution is different for each. I'll address that next in Top Query Problem: Ties. A free sample illustrating the Top Query can be found here: http://www.rogersaccesslibrary.com/forum/forum_posts.asp?TID=233.